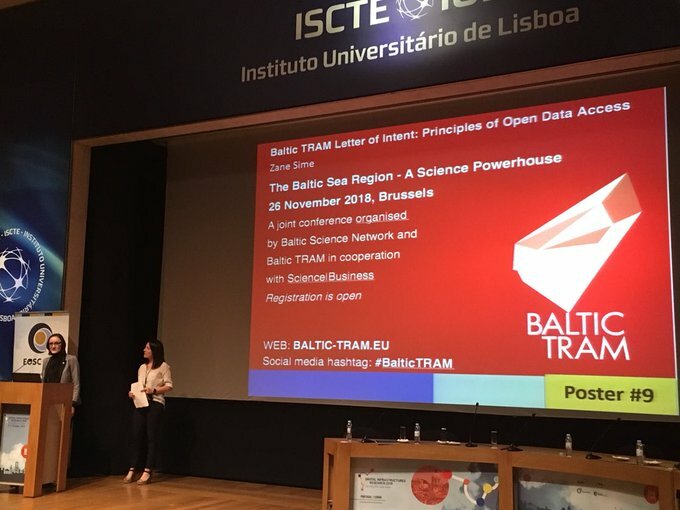 What could possibly be a better place for raising awareness about Baltic TRAM open science strand and the project´s forthcoming public debates than the key annual gathering of European stakeholders of digital infrastructures for research! On 9 October 2018, the Digital Infrastructures for Research 2018 conference took place in Lisbon at the University of Lisbon campus. As pointed out by Volker Guelzow (DESY), the co-chair of the Digital Infrastructures for Research (DI4R) Programme Committee, the event is notable “since users, providers and large infrastructure organisations get together and can discuss cross-disciplinary approaches and solutions for the burning problems of scientific work”. Baltic TRAM was presented in the poster area among almost 50 European initiatives contributing the development of digital research infrastructures. Likewise, Baltic TRAM was briefly introduced during the zapping session, which launched the best DI4R2018 poster voting contest. Due to the geographical location of this year´s conference, all attendants were encouraged to register for next month´s Brussels conference “The Baltic Sea Region – A Science Powerhouse” to continue some of the discussions commenced in Lisbon. Likewise, the Baltic TRAM poster was designed in order to promote wider awareness about the forthcoming Council of the Baltic Sea States Baltic Sea Science Day 2019 which will be held in Riga in February 2019, hosted by the Academic Centre of the University of Latvia. As usual, Baltic TRAM will be one of the key integral parts of this gathering. Updates and announcements about the event´s programme and registration details will be issued by the CBSS Secretariat on the CBSS website and social media during the upcoming months.